Offices, schools, meeting venues all have conference rooms where large numbers of people meet to exchange ideas and information. 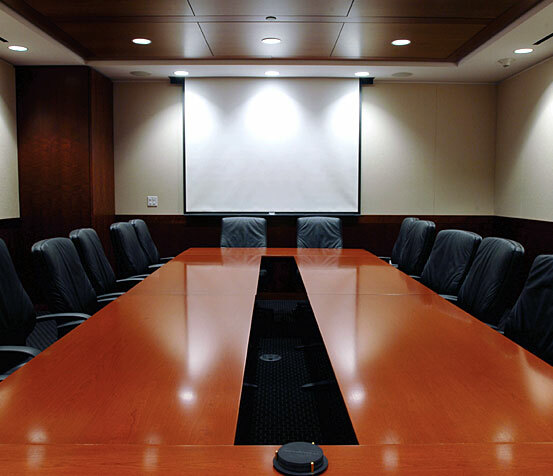 In this digital age conference rooms often rely on audio equipment, video conferencing facilities and sound systems. Conference room designers often demand an elegant minimalistic style with limited soft furnishings. This can give rise to excessive sound reverberation and poor acoustics leading to reduces clarity of voices and audio communications. Meeting and conference rooms often demand sound proofing to avoid being disturbed by outside noise or disturbing others in the building and also prevent confidential meetings being overheard. At Quietstone we offer cost effective and beautiful solutions to optimise the acoustics of any conference room. From ceilings to floors we have the ideal products for your project. We can survey the room and propose a total solution which we will build and install promptly and efficiently to your specifications. Our acoustic panels can be produced in any colour or shape to bring you beauty, functionality and affordability.